Once launched the win multiplier in the round of free spins will start at 1 and increase with every new winning combination. Regular Scatters will not land on the reels but stacks of gold bars can appear in the carts that are above the 2nd, 3rd, 4th and 5th reels. Three bars will get you 5 additional free spins and four bars will get you 10 additional free spins. The Carts bonus feature is an additional row of four mining carts that are above the 2nd, 3rd, 4th and 5th reels. The carts contain symbols and do not fall from the top but appear from the right side of the screen. The symbols in them can be included in winning combinations and the Wild symbol will only appear in the carts and not on the reels. The Reactions feature involves cascading pictures. When you form a winning combo, all symbols in it will disappear and the symbols above them will fall down and replace them. This may create another winning combo which will also disappear from the screen. Symbols will keep replacing each other until no winning combos are created. All the symbols of this slot by Big Time Gaming show playing cards, various gemstones and dynamite. They can be divided into two categories, special and standard according to their special features. The Scatter is depicted as a letter of the word Gold. When 4 of these symbols land anywhere on the game screen they will make up the word Gold and activate a bonus round of 12 free spins. Every additional Scatter that lands after the fourth one will show 5+ and earn you 5 additional free spins. The Wild is a picture of a dynamite that says Wild. It will only appear in the Carts and can replace all symbols except for the Scatter to create a winning combo. This slot is a trial version of the game that you can play for free using credits, all other features of this slot fully correspond to the original, as all the online slots available on the NeonSlot website are the licensed free demos of the real money games. It does not have paylines, instead there are up to 117,649 ways to form winning combos. The number of ways available will be randomly generated each time you launch a new spin. You can set the bet per spin between 0.2 and 20 credits using the left or right buttons in the Stake section. The Play button is found in the bottom right hand corner of the screen and launches one spin with the current bet values. To the left of it is a button with a circular arrow that opens the menu for the auto spins mode. You can choose 5 to 100 autospins and set your loss and win limits. Click Start to save all your chosen values and launch autospins. Each of the main reels of this slot can have from two to seven symbols and the number is generated randomly once you initiate a new spin. 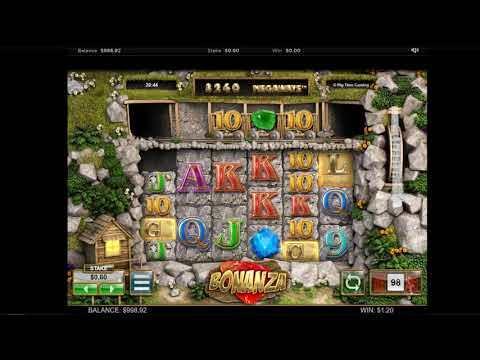 Bonanza is a slot with quality graphics, a simple interface and frequent but small rewards. The additional Carts row, cascading symbols, and round of free spins with extra multipliers are the advantages of this slot that is themed to gold mines and Jewels.